There are more sources of air pollution across the globe than we previously thought. That’s according to a new study published this May in the scientific journal, Nature Geoscience. According to the study, researchers from Canada’s climate change and environmental department and other institutions in Canada and the US found that nearly 40 spots around the globe that emit sulfur dioxide haven’t been accounted for on national reports and inventories. That’s anywhere from seven to 14 million metric tons of the pollutant that scientists have been in the dark about each year. “Generally, these previously unreported sources tended to pop up in more developing types of nations where perhaps their legal requirements for reporting are not as rigorous as what we might be used to in the US and Canada, for example,” said Chris McLinden, the study’s lead author and research scientist with Environment and Climate Change Canada. Sulfur dioxide — when released into our atmosphere — “forms sulfuric acid and fine particulate matter, secondary pollutants that have significant adverse effects on human health, the environment and the economy,” wrote the authors. Surprisingly, the volcanic emission of sulfur dioxide acts as a temporary pause to warming trends. For example, eruptions of Mount Pinatubo and Mount Hudson in 1991 spewed 23 million tons of the stuff into the stratosphere, where it persisted for about two years. Measurements taken by the NASA Goddard Institute for Space Studies found that the globe actually cooled by 0.45 degrees Celsius in the following year. But that doesn’t mean we can just sit back and not worry about it. The health concerns for sulfur dioxide exposure in the short term include respiratory problems like constriction of the bronchial tubes and asthma. According to the Environmental Protection Agency (EPA), when sulfur dioxide combines with atmospheric gases to form small particulate pollutants, it can cause emphysema and bronchitis, and can aggravate those who suffer from heart disease. As The Washington Post reports, sulfur dioxide comes from both man-made and natural sources: oil refineries, fossil fuel use, and volcanoes. Five hundred sources of sulfur dioxide have already been identified around the globe, using the current inventory system. Seventy-five sources are volcanoes and the rest fall under the category of human-caused sources. However, 39 sources weren’t identified as either natural or man-made, until now. Utilizing satellite images, scientists were able to find these 39 sources for the first time. Fourteen of the “missing” sources were located in a cluster in the Middle East, according to the satellite results, and 12 of those are associated with the oil and gas industry. The rest of the sources are located around the globe in the Americas, Europe, Asia and Africa, and are also associated with power plants. The EPA states that the largest sources of sulfur dioxide are from fossil fuel combustion at power plants, at 73 percent. Twenty percent of the sulfur dioxide in the atmosphere comes from other industrial facilities, while smaller sources include metal-extracting practices, large ships, the operation of trains, and non-road equipment. As scientists work together to devise a better system for reporting atmospheric pollutants, it will be interesting to see what else we learn from different sources around the globe and perhaps more in-depth satellite studies. Hey Buddy!, I found this information for you: "Satellites Spot Dozens of Climate-Heating Pollution Hotspots". 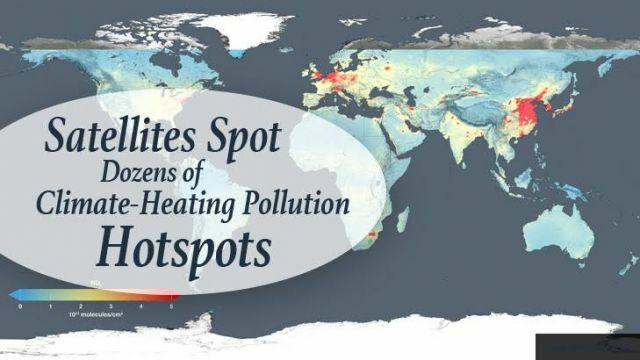 Here is the website link: https://www.thealternativedaily.com/satellites-spot-climate-heating-pollution-hotspots/. Thank you.